Making the cushion was the hardest part of this process for me, though in theory it should be fairly simple. This section assumes you have access to a sewing machine. Any sewing machine will do; my grandmother’s Singer 401A from 1957 worked great. A narrow foot and a zipper foot will be helpful in this section, but you can manage with just a standard foot. You’ll start by tracing one of the old cushion-cover panels onto foam. I used three-inch foam, which is available online or at some upholstery fabric warehouses. It’s also at places like Hancock’s, but it will be much more expensive there. Lay an old cushion panel down on your foam, trace the shape, and cut it out. I used an Olfa utility knife extended to its full length. My original cushion was about 4” thick, but I wanted to fancy it up a little bit. Websites like Restoration Hardware always mention a down-wrapped option for their upholstery cushions, and this sounded so luxurious. Furthermore, I wasn’t sure I’d be able to get the look I wanted simply by wrapping medium-density foam with polyester batting. 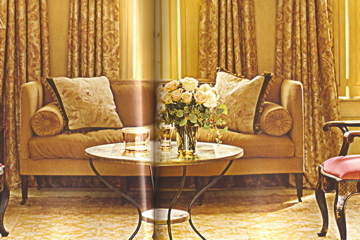 The settee I covet at Lewis and Sheron has a loose, floppy cushion that seems both heavy and soft – down, perhaps? I did some reading online and found that there are many options for cushions, besides foam. Some online stores will make custom cushions to your specifications, in either foam, down-wrapped foam, 100% feathers, or 100% down – and within these, there are different fill-densities and types of down to choose from. 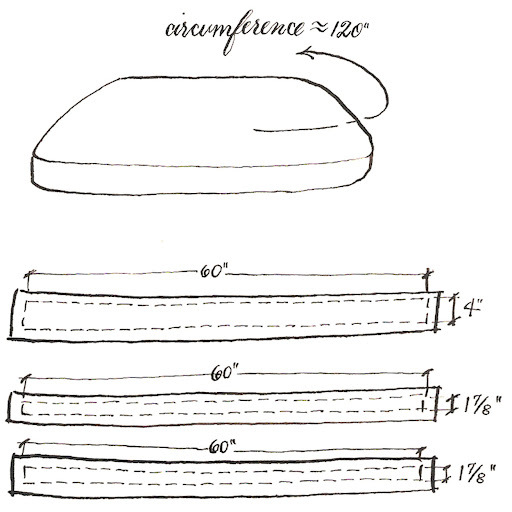 A down-wrapped cushion, it turns out, is essentially a foam cushion encased by an envelope of foam – imagine a thick down comforter wrapped around a cushion. A mix of feathers and down (essentially fluff – feathers without quills) is your best bet, as the down is exceedingly soft, and the quills in the feathers will help the wrap to self-fluff. The foam itself also facilitates fluffing; as you stand up from the foam, it re-inflates, and causes the down and feathers around it to shift. Why did I believe I could make a down envelope myself? We’ll never know. In the end, I succeeded. But not before the house was blanketed in a thick layer of feathers. To make my down wrap, I laid my cushion-shaped foam on top of a twin-sized feather bed that Jessica had given me (Thanks, Jess!). I traced the shape of the cushion, centering one of the gusset channels in the middle of the cushion. To the front of the traced shape, I added a 4” band – the thickness of the finished cushion, hopefully. This would not be a true down envelope, as it would only cover two sides of the cushion. The feather bed I had just wasn’t big enough to go all the way around – but who cares? You really only need the down on the top and front of the cushion. A cheap Ikea down comforter, or an old one that you already have, would have worked equally well for this. Once the shape was traced, I worked the feathers, as best I could, away from the traced line, to one side or the other. This is a good chance to really thicken the wrap up, if you like, by working most of the feathers to the inside of the shape. Then I made a short cut along my line, and whip-stitched around the cut to seal the feathers inside. Keep going like this, making a short cut, then whip-stitching it closed, until you’ve cut out your shape. You can stuff the extra feathers (those not inside the shape) into a garbage bag. For an extra seal, I then put the down wrap through my sewing machine, straight-stitching at the very edge of the cut I'd made. Then I straight-stitched along the line that divides the cushion shape from the front band, to define where it would fold over. Plop the wrap over your foam, and make sure it fits. Now you need to make a cover for the cushion – not the final slipcover that matches your finish fabric, but the muslin case that keeps the cushion and down-wrap together. Trace your foam onto two different pieces of white muslin, and cut them out, leaving excess at the sides. Now estimate the circumference of the shape; you’ve got to make a gusset. My gusset would be 4” wide. I halved the circumference dimension (almost 120"), and added a little excess. Each half, plus extra, was 60”. I drew out one long rectangle onto muslin, 60” long by 4” wide (plus about ½” extra on each side). The zipper needs to go on the other half of the gusset, and the zipper is about ¼” wide. So, each of these bands would be just under 2" wide. I drew two long rectangles, each 60” long by 1-7/8” wide, plus extra on the sides and ends, and cut them out. Now install the zipper. At one of the lines you marked to indicate 1-7/8”, fold the fabric down, so the wrong sides touch each other, and iron it flat, the whole length. Place this fabric, right side up, on your zipper, also right side up, with the fold touching the teeth of the zipper. 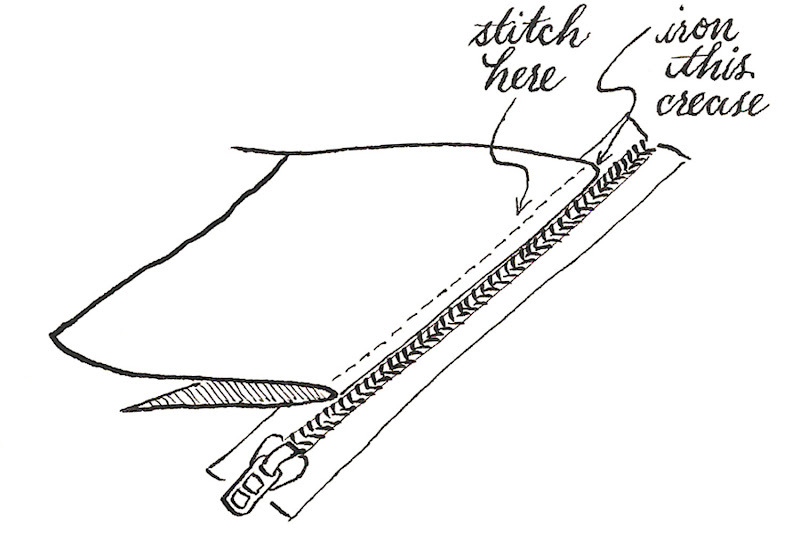 Use a narrow foot or a zipper foot to straight-stitch the zipper on. Repeat for the other side, and you should have a band that’s 4” wide, plus extra at the sides. Sew the two lengths together at the ends to make one 120”-long band. This is your gusset! Now you need to attach your two sides (cushion top and bottom, the shapes you cut earlier) to the gusset. Match up the line on one side of your gusset with the shape that you marked for one of the cushion panels, going all the way around, but leaving about 2” at each end of the gusset, for adjustments – I’ll get to this. Position the gusset so that the zipper is in the back of the cushion. Sew all the way around, keeping the line on your gusset matched with the line on your muslin panel. Repeat with the other panel, again leaving 2” at each end. Trim off the excess length, fold over the excess on the side without the zipper, and sew it onto the side with the zipper, making the appropriate length. Now you can finish sewing the gusset onto both the panels. This is helpful because I’ve found it impossible to accurately guess exactly how long the gusset will need to be (although we’ll be forced to do this with the cushion’s slipcover). It’s much easier to just leave yourself some flexibility and adjust for the correct length at the very end. Now that you have the cushion case, stuff the foam, with the down-wrap draped over it, into the case. It will take some arranging to get this exactly right. Sew, by hand, a few stitches all around the edge of the case, using the top seam or the zipper seam at the back and sides, and the bottom seam in the front, anchoring the down-wrap into the cushion case. Anchor it, also, in a few places along the top-front seam, where the wrap folds. You’ve got yourself a down-wrapped cushion now! Take a good roll in the blanket of feathers on your floor! Time for the slipcover, then. You’re basically going to repeat the steps you used to make the cushion case, with one notable exception, and that is the way you attach the gusset. Go through the same steps, tracing and cutting out your top and bottom cushion panels, and measuring a 4” band and two 1-7/8” bands – but leave about an inch of excess fabric on the sides. Install your zipper. Form your long (120” plus extra) gusset band by folding the plain band over and sewing it onto the zippered band. For this gusset, you need to form it into a continuous circle before you attach it to the panels, so you must be sure to get the circumference right. Circle the band around the foam you cut for the cushion, pull it taut, and pin it to maintain that length. Remove it from the cushion, and tighten your circle by about one inch – the gusset will stretch and loosen, and you want it fairly tight. Sew the ends of the gusset at this length. You need seven yards of piping cord, a little more than 240” (the length of two 120” circumferences.) This is available at any sewing store; I used cotton cord about 1/8” in diameter. Lay the cord along the mark you made on the band (the marks from the wide band and each of the narrow bands should meet each other at the seam), fold the excess over, and straight-stitch, using a narrow foot or a zipper foot, as closely as possible to the concealed cord. Cut the end of the cord to abut the other end of the cord, as you complete the circle. Repeat for the other side. The piping that this creates is called self-cording. It does require making a circular gusset (rather than allowing you the flexibility you had in constructing the cushion case), but self-cording is so much easier than making a separate length of piping and sewing it in between the gusset and the panels. Unless you’re an expert, it’s hard to get a really neat result with separate piping. Pin one panel carefully along the gusset. Hopefully, the gusset will prove to be the right length. My gusset was too long, and I had to go back and remove an inch before I could pin it correctly. Once you’re assured that it is the right length, sew the panel on. Repeat with the other panel. Cut four 2” by 4” bands from the finish fabric. For each one, fold the edges of the bands over, lengthwise, and sew to make a finished band. Align each of these with the elastic clips you installed in the sofa frame, slip on a D-ring, and sew them on to the slipcover. Slip over your cushion, zip up, shoo the dog off the sofa, and clip the cushion in. You’re done! It’s been a wild, wild ride. You can get an almost-as-cute mutt at any old animal shelter or humane society. Make sure to get the warranty; ours has broken several times. A lot of work - a great result! It looks wonderful. Congratulations! No way would I have the patience to do all that, but your hard work paid off in the end. WOWWW this is incredible!!! It looks absolutely amazing. I'm very very very impressed. great, now it smells like a stinky dog. way to go. I bet you drive around town with the dog in your lap while it barks out the window. 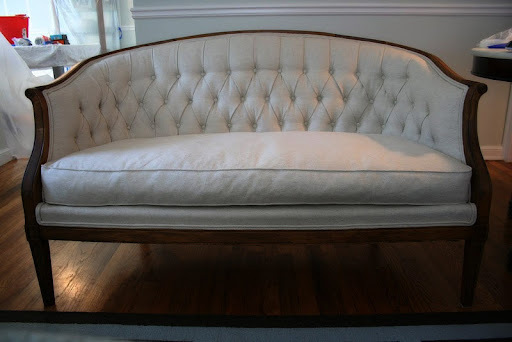 I've been searching for a tutorial on how to do this on a settee with exposed wood- yours is the only one I could find, and then it turns out you're in Atlanta too and so I can use the same stores you did! How wonderful. Mine doesn't have a separate cushion on the seat, but I'm sure we can adapt these instructions. I'm so thrilled! Just found your blog...thanks for the detailed instructions. You did a fantastic job. I have a mutt, and they look identical. We have been trying to figuring out his mix of breeds and have been very unsuccessful! The vets aren't even sure. Do you have any idea what your dog is mixed with? We have no idea! The shelter called him a Collie/German Shepherd mix, and we almost didn't adopt him because we thought he'd be 80 pounds someday. Instead, he's 30 pounds, and we figure they meant Sheltie instead of Collie. But he has exactly the same silhouette as a golden retriever, so ... who knows. 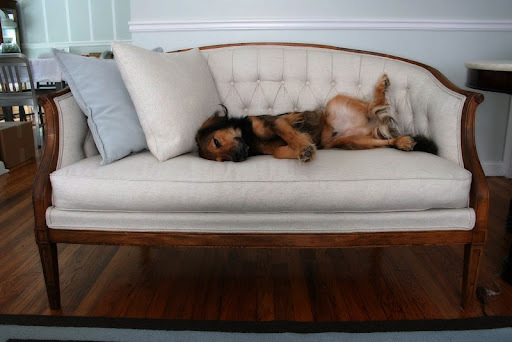 Our vet is always saying he's a classic mutt - what mutts used to look like, before everything was a pitbull-lab-chow mix. Leslee - what a nice thing to say! Thanks for reading us. Unbelievable. I was feeling hopeless and lost at the prospect of making feather wraps for some foam armchair cushions. Now I feel completely useless and overwhelmed at the scale of your project. And you won! Just as well, or doggie would not have been nearly as comfortable. Congratulations to both of you: to you for your stupendous efforts, and to your boy for having chosen such a clever human! Mon englais est trop mauvais, je tenais juste à vous remercier pour votre partage. Efficace et intéressant, BRAVO !!!! Merci pour ce partage. Beau travail. Explications particulièrement détaillées.